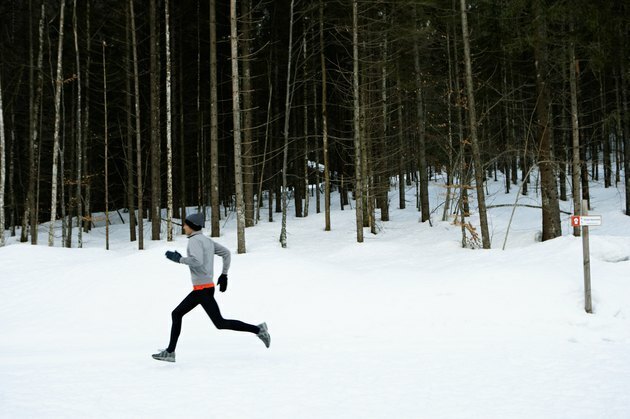 Winter weather conditions need not hinder you from getting in a quality run. You need the right clothing as well as some common sense to tackle the elements. If you have a lung condition like asthma, or if the air is particularly cold and dry, your doctor may recommend running with a face mask. Avoid certain conditions like blizzards and freezing rain, but with proper preparation, you can take your winter workout outdoors. When it comes to running in the winter, layering your clothing is vital to prevent hypothermia. Though you do not want to be overly cold when you start out, beginning in clothes that are warm or hot cause more sweating — and more moisture puts you at higher risk for hypothermia. Writing for the Marathon Training website, physical therapist and avid runner Randall Brown recommends a base layer of a lightweight material that pulls moisture away from your skin, like polypropylene. A second layer of fleece or wool for insulation and a wind-waterproof outer layer helps keep you warm and dry. Select warm socks; consider waterproof shoes and wear a hat and gloves. Wind has a serious impact on temperature. Able to drive snow, sleet and ice into your face, wind makes running in winter more difficult. Run into the wind on your way out, Brown recommends. Coming home into a headwind -- when you are sweaty -- increases your risk for chills and hypothermia. Wearing a balaclava, a hat-face mask combination, keeps your face and your breath warm when the air is particularly cold and dry. As the thermometer drops, the air that you breathe in gets colder. Inhaling cold, dry air can cause reactions in your lungs, like asthma. Try to breathe through your nose as much as possible, which warms the air slightly before it enters your lungs. Facemasks, which are available for sports like skiing, help to add warmth and moisture to air before it hits your lungs. Masks can cover or leave and opening for your mouth. Facemasks and balaclavas help keep the skin of your face warm, which can decrease your risk for cold-induced asthma. Some neoprene masks cover your mouth and nose, but have perforated holes in the mouth, nose and ear areas. Talk to your doctor before attempting to run in cold weather; he may suggest a specific mask depending on your health. Marathon Training; The Weather Outside is Frightful; Randall J. Brown, M.H.S., P.T. Dr. Pribut's Running Injuries Page; Running in the Cold; Stephen M. Pribut, D.P.M. Can Running in the Rain Make You Sick?